David Hess, an assistant professor at the University of Michigan's business school. He thinks about incentives for corporations to keep themselves clean -- through the use of sustainability reports, the Federal Sentencing Guidelines, and deferred prosecution agreements, among others. Rebecca Walker, a private practitioner, whose ideas on “associative liability” and extending codes of conduct to third parties are important to anyone in the compliance business. And she's humble and charming. David C. Weiss, a law student at the University of Michigan. He wrote a terrific article for the January 17, 2009 Michigan Journal of International Law. It asks why the Securities and Exchange Commission uses disgorgement in FCPA enforcement actions, where the remedy came from, and where it's going. Great questions, and he's got some answers too. Andy Spalding, a lawyer and Fulbright scholar. He argues that the Foreign Corrupt Practices Act -- are you ready? -- causes corruption and hurts poor people. Andy respects the rule of law but also spends time trying to understand how laws really work. You've got to love a smart, well-spoken policy-wonking lawyer. As we said when we first heard his ideas, they're a real mind bender. 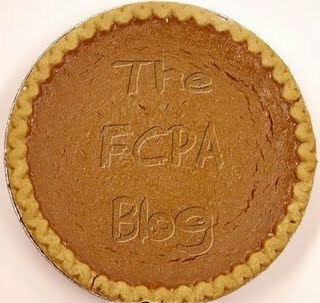 wrageblog, where Alexandra Wrage of TRACE has created a bulletin board for the compliance community. She and her contributors dish some great advice. We received a nice invitation to pen a few words there and we're planning to do that soon. Mike Koehler's fcpa professor is a new resource. He had an FCPA practice for ten years and now teaches business law at Butler University. Many times over the years Mike has helped us understand FCPA enforcement practices, particularly at the SEC. We enjoy his view of the statute itself and what he thinks the words in it are supposed mean. Kevin LaCroix's D & O Diary. A reviewer might call his work authoritative, influential, magisterial, and quirky enough to always be inviting. We'll just say it's a must-read site. It might well be asked why anyone should bother reading both the Wall Street Journal and the New York Times business pages. After all, both usually cover the same stories. Indeed, on Friday, both ran stories discussing the fact that year-to-date bank failures are at the highest level since 1992. Gabe’s Guide to the e_Discovery Universe. It's wild. There can be nearly a hundred posts a month, and its artwork and headlines are reason enough to visit (Crazy woman comes up with notion that e-discovery professionals should be “qualified”). Gabe is bursting with enthusiasm and goodwill, and he's always generous with his praise and attributions. We'll have more to say about other friends and neighbors later. But, as mentioned, the survey was a general survey, asking organizations in a wide variety of industries about third party codes. In that, more general, context, I do think that it is important that organizations exercise caution when extending compliance requirements to third parties. Part of my concern flows from the fairly well-accepted theory in the compliance world that standards that are neither monitored nor enforced can be detrimental to a compliance program. They can corrode employees’ and other stakeholders’ belief in the program and cause a general loss of program credibility. So to the extent that an organization promulgates a code but doesn’t take any steps to implement or monitor compliance with the code, it can actually be detrimental to the organization’s compliance program and the culture of compliance and ethics more generally. In addition, and to get to the question you posed, there is the “associative liability” risk that I mention in the article – an important consideration in some settings (although, I should stress again, it is not really relevant to FCPA compliance). That is a term that I like to think I coined, but I Googled it, and I found a couple of references to it before I first used the term a few years ago. The manner in which this risk most often arises for organizations is in the context of third parties who are temporary employees or employees of a contractor or subcontractor of the organization. These employees may claim an employment relationship based in part on compliance program elements (typically policies, codes and/or training) that the organization sought to apply to them, and bring a claim based in part on that alleged relationship. In the supplier context, there have been a few suits claiming that supplier codes have created liability for the misconduct of the suppliers, but they have been largely unsuccessful. For example, there was a fairly famous case against Wal-Mart a few years ago (Doe v. Wal-Mart, Cal. Sup. Ct. Los Angeles (Sep. 13, 2005)), in which the International Labor Rights Fund brought suit against Wal-Mart on behalf of a purported class of Bangladeshi, Chinese, Indonesian, Nicaraguan, Swazilander and U.S. workers for alleged violations of Wal-Mart’s code of conduct for suppliers. The allegation was basically that Wal-Mart assumed a duty (in contract) to the employees of the suppliers when it promulgated the code and made it a part of the supplier contracts, and that it breached its contractual duty (claiming that the employees are third-party beneficiaries). However, in Chen v. Street Beat Sportswear, Inc., 226 F.Supp.2d 355 (E.D.N.Y. 2002), the court did find liability, although the facts of that case are fairly unique. There is also the risk that I mention in the article of reputational harm. There are examples of organizations receiving bad press for promulgating standards for third parties that they fail to monitor or enforce, including, e.g., Levi-Strauss and Starbucks. A note to our readers: Rebecca's book, Conflicts of Interest in Business and the Professions: Law and Compliance, is available here. The publisher's description says, "This treatise covers how to identify, detect, manage and resolve conflicts of interest. It details the knowledge gap about conflicts of interest by discussing various situations and analyzing compliance steps to cope with conflicts. The goal is to help those who deal with conflicts of interest in the business and professional worlds do so more effectively. Discussion includes conflicts of interest within organizations including corporations, employer/employee relationships, shareholders, partnerships, associations and government, as well as professional conflicts including lawyers, investment advisors, retail brokerage, auditors, lobbyists, journalists, research analysts and trustees."